Kattali Textile Limited IPO Lottery Result & Information found here. 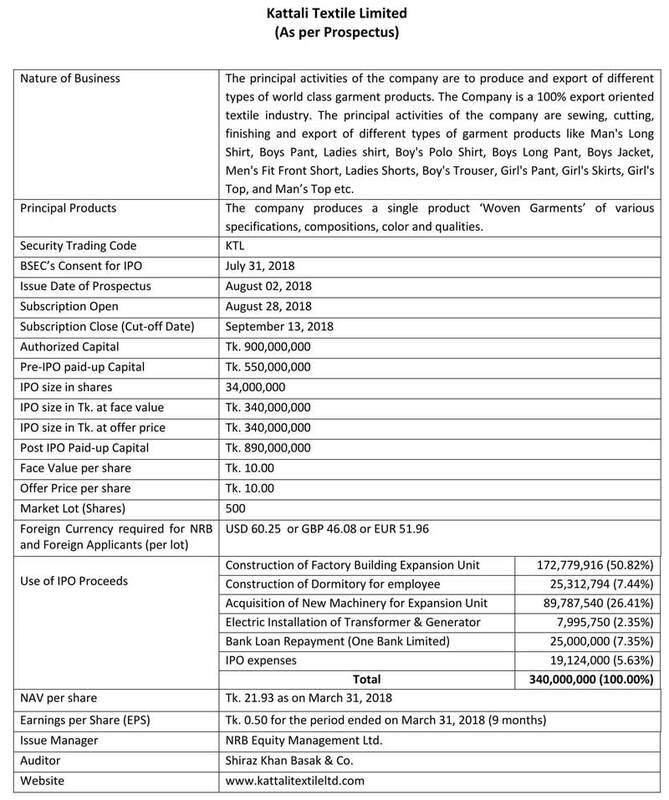 Kattali Textile Limited IPO Lottery Result published on 04 October 2018 & found here. Kattali Textile Limited Subscription Open from August 28, 2018, and Close on September 13, 2018. Kattali Textile Limited IPO Lottery Result updated. Download Kattali Textile Limited IPO Lottery Result that will be published & found here. IPO or an Initial Public Offer (IPO) is the first sale of a stock by a private company to the public company. In this way, a company can increase money by issuing either debt or equity. IPO or Share market inauguration is a type of public offer in which shares of a company generally are sold to the predictable investors that in turn, sell to the general public by a securities exchange for the first time. Kattali Textile Limited IPO Lottery Result found here. Bangladesh Securities and Exchange Commission (BSEC) has approved the initial public offering (IPO) of Kattali Textile Limited on 26 June 2018 at their 648th board meeting. BSEC approved the IPO of the company to raise capital of Tk 34 crore from the market through Fixed price method. According to the financial statement for the 9th month ended on March 31, 2018, the company’s net asset value (NAV) per share is Tk 21.93. The earnings per share (EPS) was Tk 0.50 for the 9th Month ended on March 31, 2018. NRB Equity Management Limited have acted on behalf of the company’s issue manager. The company’s IPO fund will be used to purchase machinery, to repay bank loans and to bear IPO expenses & IPO related other relevant expenses according to the IPO prospectus. Kattali Textile Limited IPO Lottery Result 2018 published on 04 October 2018 & found here. Download Kattali Textile Limited IPO Lottery Result from here. After ending of application of Initial Public Offer (IPO) from 28 August 2018 to 13 September 2018. Kattali Textile Limited IPO Lottery draw held on 04 October 2018. Place: AGB Colony, Motijhel, Dhaka at 10:30 A.M. The IPO results will be published on the websites of Dhaka Stock Exchange (DSE), Chittagong Stock Exchange (CSE) and the company’s website after the lottery programmed. See the Result below. Issue Manager: NRB Equity Management Limited have acted on behalf of the company’s issue manager. Kattali Textile is a production unit of Asian Group, established in 2002 with the aim of catering to world-class buyers. Kattali Textile Limited has been a pioneer in apparel making since its induction in 2002. Over the years it has expanded its production facilities and now boasts a capacity of producing 4,702,500 pcs a year. The apparel unit is specialized in the production of Woven and Knit Tops & Bottoms. It has served many international buyers in the North American and the European market and continues to strive in the highly competitive apparel-manufacturing sector. The Bangladesh Securities and Exchange Commission (BSEC) has approved the initial publication of Kattali Textile (IPO) for withdrawing money from the stock exchange. This approval has been given in 648th regular meeting of the Commission. Tuesday (June 26th) BSEEC executive director and marketer said. This information was revealed in a press release signed by Saifur Rahman. 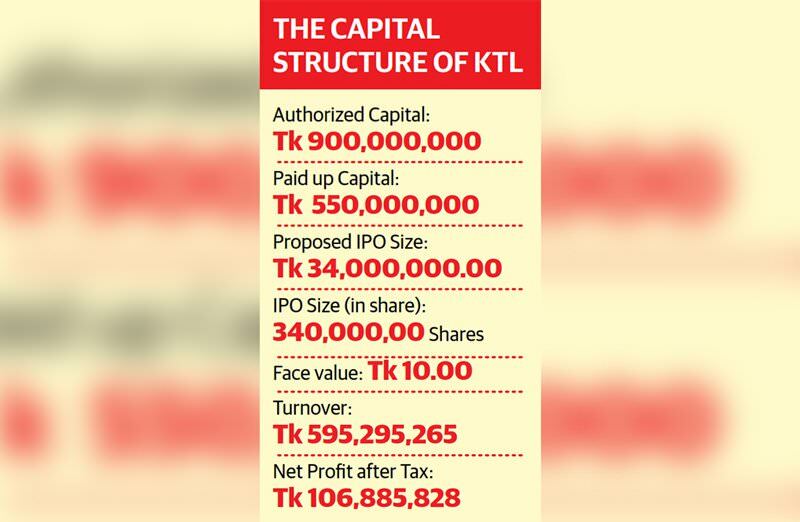 The Kattali Textile Stock Exchange has approved the withdrawal of Tk 34 crore. In this case, the company will collect this money only by issuing a face value of 10 rupees to 3 crore 40 lac ordinary shares. With the withdrawal money, the company will purchase the equipment, construct dormitory buildings, repay the loan, install the generator, install electric transformer and use the IPO. The company’s earnings per share (EPS) in the financial year 2016-17 is 1.94 taka. And on June 30, 2017, the net asset value (NAVPS) of the shares rose to Tk 20.48 without evaluation. Reference, NRB Equity Management Limited, is responsible for the company’s issue management. Nature of Business: The principal activities of the company are to produce and export of different types of world class garment products. The Company is a 100% export oriented textile industry. The principal activities of the company are sewing, cutting, finishing and export of different types of garment products like Man’s Long Shirt, Boys Pant, Ladies shirt, Boy’s Polo Shirt, Boys Long Pant, Boys Jacket, Men’s Fit Front Short, Ladies Shorts, Boy’s Trouser, Girl’s Pant, Girl’s Skirts, Girl’s Top, and Man’s Top etc. Principal Products: The Company produces Man’s Long Shirt, Boys Pant, Ladies shirt, Boy’s Polo Shirt, Boys Long Pant, Boys Jacket, Men’s Fit Front Short, Ladies Shorts, Boy’s Trouser, Girl’s Pant, Girl’s Skirts, Girl’s Top, and Man‘s Top & various specifications, compositions, color and qualities. Kattali Textile Limited is mainly engaged in manufacturing of high class yarn in Bangladesh and marketing and selling of product in the worldwide and domestic Market. The installation of a high capacity air conditioning and filtration plant has enabled the mill to meet the international standards. The Principal activities and nature of the business of the company is to manufacture of high quality yarn in Bangladesh and marketing and selling of product in the global and domestic Market. The company manufactures auto coned electronically cleared cotton yarns for weaving and knitting applications.